The National Association of Community Health Centers (NACHC) has partnered with Direct Relief to establish a special fund to support the patients and nonprofit health centers and clinics in areas affected by Hurricane Sandy. All contributions to the Sandy Safety-Net Fund will be used exclusively to support nonprofit healthcare safety-net facilities and related activities in affected communities. “We are deeply saddened by the widespread destruction and tragic loss of life that has occurred in our communities, and we believe it is essential in the storm’s aftermath to support the existing, community-based nonprofit health organizations that provide essential health services to the people who are most vulnerable. The scale of this emergency clearly exceeds the capacity of any one nonprofit organization to address, which is why we are joining together to ensure that at least some of the private charitable resources being so generously given are available to the nonprofit health centers and clinics on the front lines in these communities. NACHC is the membership organization for Community Health Centers, which provide primary and preventive health care to more than 20 million people from more than 8,000 sites across the nation. Direct Relief, established in 1948, is the only U.S. nonprofit organization licensed to distribute prescription medications in all 50 states and runs the largest nonprofit program in the country providing donations of medications and supplies to serve low-income, uninsured patients at more than 1,000 nonprofit health centers and clinics on an ongoing basis and in emergency situations. NACHC and Direct Relief have worked together on a series of initiatives, beginning with Hurricane Katrina, to mobilize private charitable resources for the benefit of patients at nonprofit safety-net health centers and clinics and on emergency preparedness and response activities. Among other initiatives, Direct Relief annually conducts an extensive Hurricane Preparedness Program that prepositions emergency medications and supplies at nonprofit Community Health Centers and clinics in hurricane-prone areas to assure that some resources are already on-hand when emergencies arise. Tax-deductible contributions to the Sandy Safety-Net Fund may be made to a specially designated account at www.DirectRelief.org. Contributions to this fund will be restricted and will be used only on activities to assist communities affected by Hurricane Sandy as jointly determined by the two organizations. Such contributions will not become part of a general disaster fund. 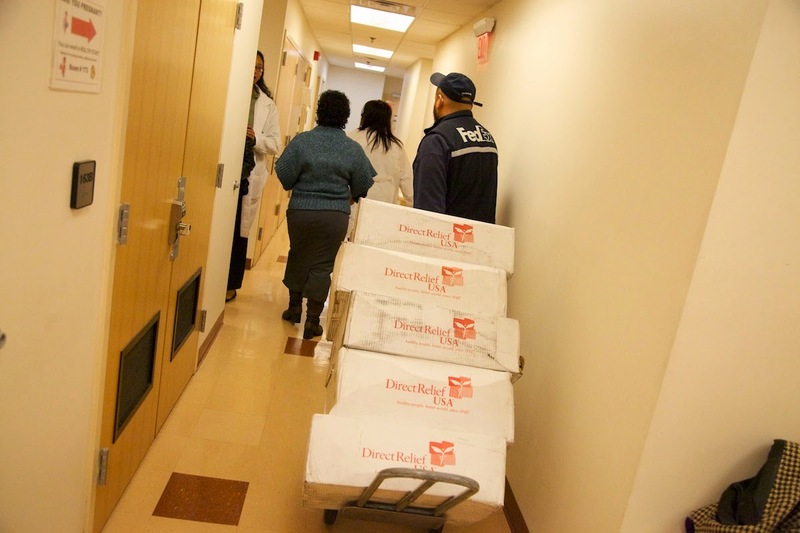 Direct Relief has already committed $1 million in cash and made its entire inventory of $25 million of medications and supplies available to assist in the Hurricane-affected areas and has sent initial shipments of medications, nutritional products, and personal hygiene supplies in response to requests from affected facilities in New York, New Jersey, and Pennsylvania.